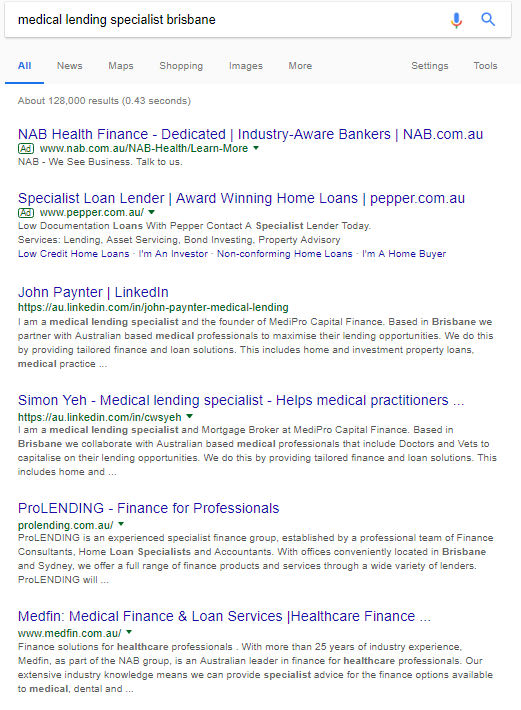 Based in Brisbane, MediPro Capital Finance provide finance lending, targeting their services within the medical profession. LinkedIn was the ideal platform for their business to generate leads and attain more clients. Stage 1 was the implementation of a 3-point strategy. Leverage SEO to increase visibility within LinkedIn and Google. Develop consistent profile content across the team and develop a targeted content management strategy. Engage in a targeted messaging campaign. Initial consistent growth in leads followed by spikes in growth when messaging campaigns are implemented. Because of the changes made to increase search engine optimisation, the team members’ LinkedIn Profiles are now returned at a higher rate within Google Search. They rank organically above major competitors and as a result, have seen an increase of organic traffic to their LinkedIn profiles. This is further supported by consistent and professional content both in their LinkedIn profiles and written content strategy. Once established, there were x2 targeted messaging campaigns run.